he Moultrie M880 camera is a popular model in the world of trail cameras. This is mainly because of the fact that it has a lot to offer for an affordable price. It also comes in a compact size which makes it fairly easy to conceal. This camera has HD video capabilities and an 8MP camera resolution. This makes photos and videos a lot clearer and with higher quality. It also has a longer night time range which enables it to capture more objects and wildlife. The Moultrie M-880 trail camera also has an almost invisible low glow infrared flash. This is very useful as it will get you clear photos without scaring any wildlife that will be near the camera. Additional pieces of information are also stamp in the photo like the time, date, camera ID and moon phase. A good feature of this camera is its quick trigger and recovery time. Because of this, you are able to catch up with the speedy movements of the wildlife hanging around the area. You are also ensured that the camera will not miss any important shots. This camera will also allow you to set it to take multi-shots to capture the motion of the wildlife. It also has a “Motion Freeze” option that is very helpful at night to reduce the blur of the captured object. Using this with the bright LED’s, you will capture some nice night time game pictures. This camera holds up to 8 AA batteries. With this many batteries, you can capture up to 9,500 photos. That is already a lot and you can already establish wildlife patterns with that many pictures. Take up 9,500 + images on one set of batteries Note: Use of video will drastically reduce this. 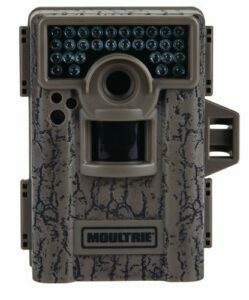 If you feel that this game camera doesn’t offer everything you need, I recommend you check out my nr 1 recommendation, the Moultrie-990i. If you feel like the M-880 won’t cover enough area, the Moultrie Panoramic 150 is a great alternative. Overall, the Moultrie M-880 trail camera is surely a good value for your money. This small but durable package will certainly provide your needs for a successful scouting.